FRANK FREDERICK L'ESPERANCE was born in Camden NJ on August 5, 1883 to Frederick T. L'Esperance and Mary Stout L'Esperance. 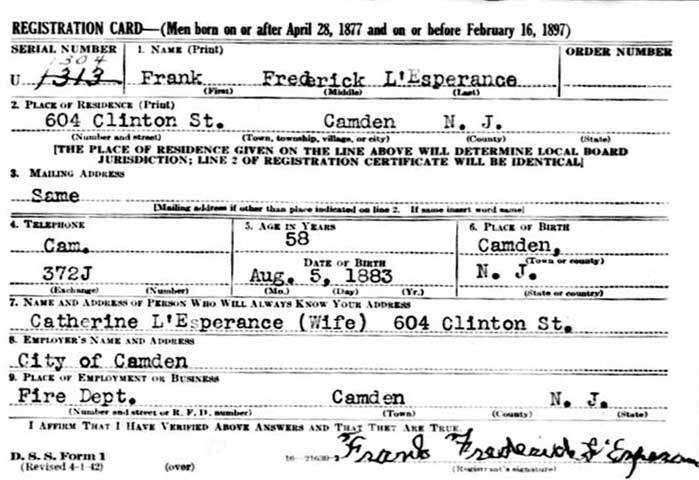 His WWI draft card states his name as "Frederick Franklin L'Esperance", while his WWII draft card and fire department records have his name as Frank Frederick L'Esperance. Frederick T. L'Esperance, was born around 1854 in Pennsylvania. He appears in the 1878-1879 City Directory at 606 North 5th Street with his widowed mother. The 1880 Census as living in Camden with widowed mother Elizabeth and a sister, Amelia, and working as a paperhanger. He married Mary Stout soon afterwards. The 1883-1884 City Directory shows the family at 510 North 3rd Street. Frederick T. L'Esperance appears in the Camden City Directories in the years 1885 through 1914 and in the 1900 Census as living at 540 South 6th Street in Camden, and worked as a paperhanger and on occasion as a clerk. Mary L'Esperance worked as a music teacher and later was involved in a grocery business. Frank L'Esperance married his wife Jennie around the turn of the century. In June of 1903 his first son LeRoy D. was born. Another son, Wendell B., was born in 1909. The 1906 City Directory shows Frank L'Esperance working as a painter and living at 545 South 6th Street, across the street from his parents where were still living at 540 South 6th Street. His father was still working as a paperhanger, and his mother Mary was partners in a grocery at 600 Clinton Street with Charles Hollenbaugh. The business was called, appropriately enough, L'Esperance & Hollenbaugh. Frank L'Esperance and family had moved to 738 Division Street by 1910. By 1918 they had moved to 541 Roberts Street. 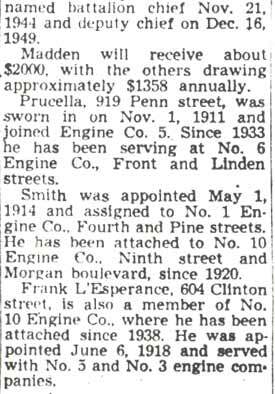 Frank L'Esperance joined the Camden Fire Department on June 6, 1918. He appears in the 1920 census as Frederick F. L'Esperance. He is then living at 541 Roberts Street. 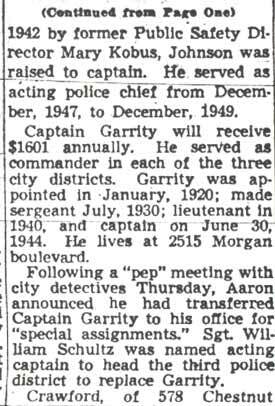 By April of 1930 he was renting a house at 606 Clinton Street in South Camden. 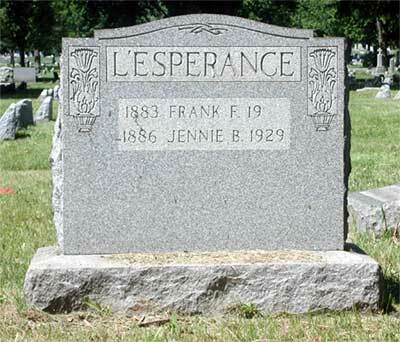 Sadly by then he was a widower, Jennie L'Esperance having passed in 1929. 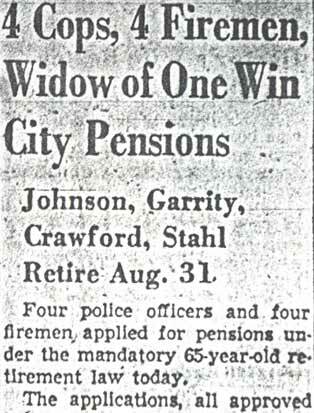 Fire Department records from 1931 show him living at 632 Berkley Street. 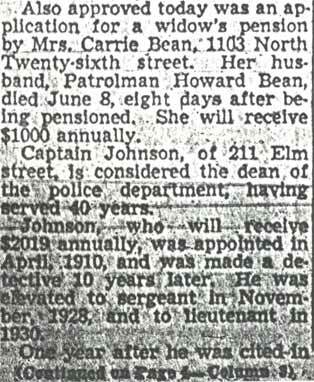 He remarried, and by 1947 was living at 604 Clinton Street. 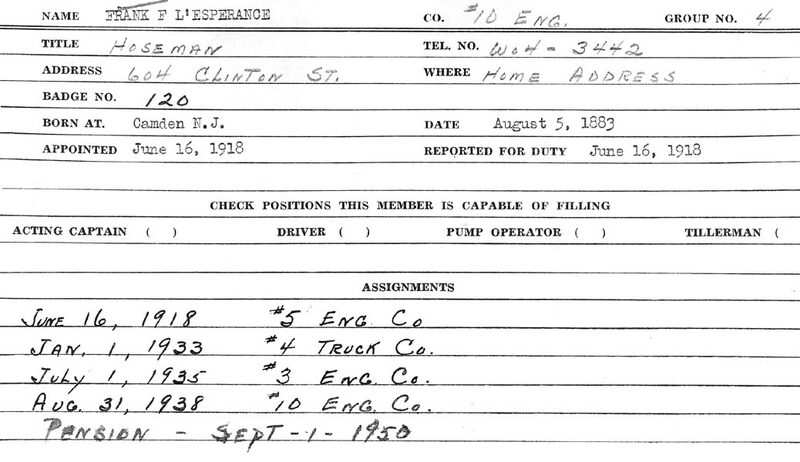 Frank L'Esperance served with the Engine Company Number 5 at 5th and Arch Streets and the Engine Company Number 3 before being assigned to the Engine Company Number 10 at Ninth Street and Morgan Boulevard in 1938, in the Fairview section of Camden NJ, where he served with Spencer Smith Sr..
Frank L'Esperance applied for his pension in July of 1950, a mandatory retirement at 65 law having been passed covering police and firemen. 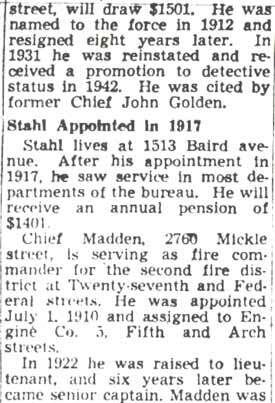 His last day on the fire department was August 31, 1950, when he retired along with Deputy Chief Clarence T. Madden Sr., Firemen John B. 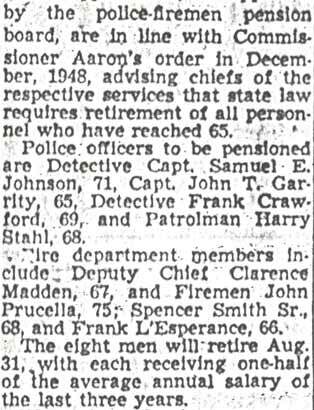 "Shorty" Prucella, and Fireman Spencer Smith Sr..
Frank L'Esperance passed away sometime between October of 1956 and October of 1959. He was survived by his second wife, Catherine, and his two sons, and grandchildren.